I spotted this neat descending triangle support test on the 4-hour chart of GBP/CHF, and market sentiment seems to be lining up for a bounce. What do you think? The pair has been selling off for a little over a month already, making its way back down to the descending triangle bottom just above the 1.2500 major psychological support. With no major catalysts from the U.K. lined up this week, I’m thinking pound traders could start booking their profits at this support zone now that we’re nearing the end of the month and quarter. I decided to wait and see how price would react to the triangle support first before hopping in, only going long at market when it looked like the floor was holding. I was able to enter at 1.2585 and I set my stop below the triangle support and 1.2400 handle to give me room to cut in case a downside break takes place. 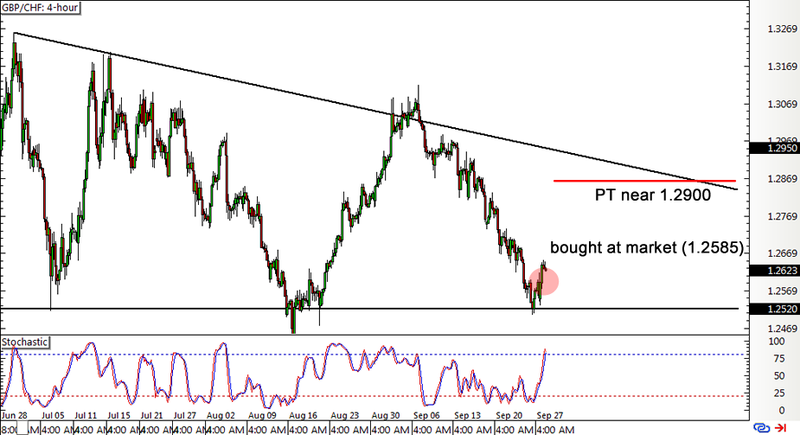 I’ll be aiming for the triangle resistance near the 1.2900 mark for my profit target. The pound could be able to keep its head above water for now, especially since the BOE refrained from adding stimulus and going all-out panic mode in their latest policy decision. Besides, PMI readings from the manufacturing, services, and construction sectors have been particularly impressive in the past month, suggesting that the U.K. economy has been able to keep calm and carry on after the Brexit vote. As Forex Ninja noted in his latest COT update, long pound positioning picked up as large speculators have been trimming their net bearish bets on the U.K. currency for three consecutive weeks already. However, I have to be careful in playing this one since traders seem to be increasing their long bets on the Swissy as well. I’ll keep y’all posted if I decide to make risk adjustments or take my profits and run! Long GBP/CHF at market (1.2585), stop loss at 1.2375, profit target at 1.2875. I’ve risked 0.5% of my account on this setup for a potential 1.4-to-1 R:R.